There are tasks that some machines can complete better and faster than can other machines if (HUGE “if”) their efforts are augmented by human talents. Conversely, there are tasks that some people can complete better and faster than can other people if (another HUGE “if”) their efforts are augmented by technology. All of these steps are examined in Chapter 3, pages 76-77. Machines do not live in fear of being replaced by humans…or by another machine. 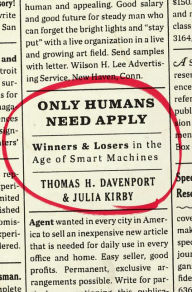 As I read the concluding paragraph of this book, I was again reminded of a passage from Alvin Toffler’s The Third Wave: “The illiterate of the 21st century will not be those who cannot read and write, but those who cannot learn, unlearn, and relearn.” It is naive to think that government will create jobs for those who do not currently possess employable skills. They must prepare themselves for and then pursue opportunities in human-machine augmentation. They must either add value to what machines can do or have the machines add value to what they can do.